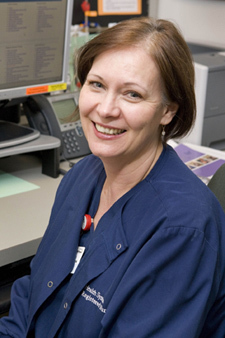 Background: Katrine Murray used the Epic electronic health record system while working in the ICU at Queen's Medical Center in Honolulu, Hawaii. You worked in the ICU when Epic "went live" at Queen's Medical Center in 2006. Describe what that was like. It was a bit surreal -- it happened at midnight on a weekend. There were a lot of people in the hospital that night -- hospital management and people from Epic taking notes on where fixes needed to be made. Super-users were on hand to help. It's a big hospital -- about 500 beds -- and the trauma center for the Hawaiian Islands. At Queen's CCU/ICU/Telemetry were combined, and the management tried to increase the ratio of nurses to patients. It was a great idea, although not all areas were able to do that. Did you feel ready to use the system when it went live? We went to a lot of classes, and we had handouts and cheat sheets. Most of us were fresh to the system at go-live, and no one felt they were ready. But until you get out and do it live, it's hard to feel like you've learned enough. How long did it take you to get up to speed on Epic? A week, if that. We went from paper charts to electronic all at once. The transition should be easier here, because people are used to computer charting. What advice do you have for nurses here when CareConnect goes live? It was challenging for the entire hospital to go live in one night. You have to be really prepared and anticipate what your patient is going to need in the next six hours. There may be delays as other areas -- like pharmacy and radiology -- catch up. Have patience, and confidence: You'll have cheat sheets to use and hopefully enough super users to rely on. What could have made the implementation easier? There were not enough Super-users -- people who knew Epic and had nursing knowledge -- on hand that first night. The amount of help Epic staff could provide that first night was limited because of their lack of medical knowledge, but they did get issues with the system we discovered after go-live fixed quickly. ICU-specific trainers would have helped. How is it using UCLA's electronic charting system compared to Epic? UCLA's system is slower and less user-friendly. Epic is far more efficient for things like skin assessments, evidence-based protocols like VAP (Ventilator-Acquired Pneumonia), or sedation holidays. It improves quality of care by offering care reminders, such as the Braden Scale if you hadn't done your skin assessment. What did you like best about Epic? It's much faster and more efficient. It's more nurse-friendly for charting. It has more appropriate choices on drop-down menus for patient assessment. It covered all the things it should cover for my patient population. I was able to look after my patient and chart appropriately without it taking all day. Anything else? Yes, I really liked that EPIC has strong controls to make sure inappropriate access to patient information doesn't happen.